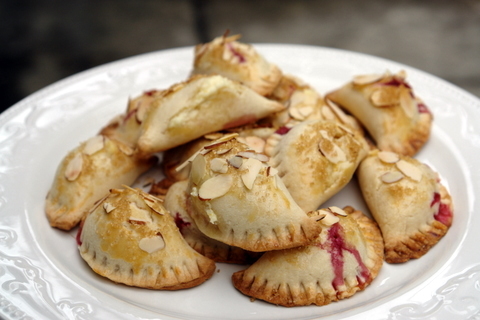 These raspberry, goat cheese and almond empanadas or sweet turnovers are a delicious dessert. 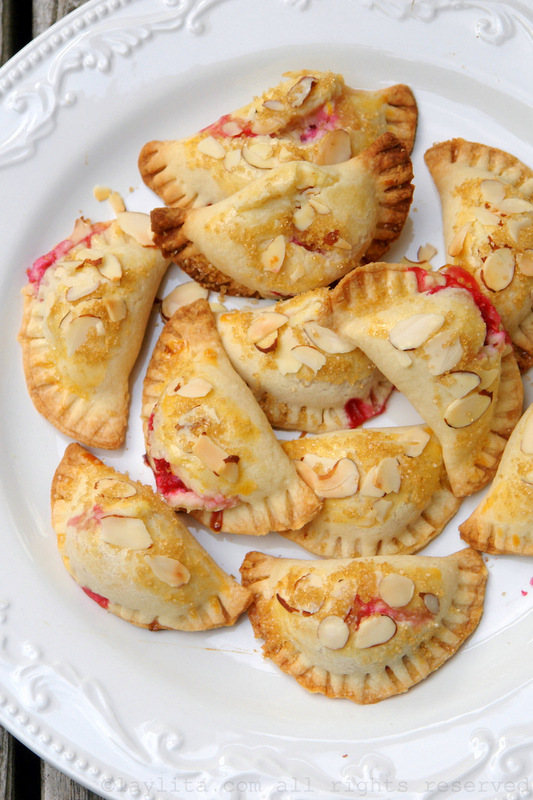 These sweet empanadas are made with a filling of fresh raspberries, a sweet goat cheese mix with vanilla/orange zest, and sliced almonds. 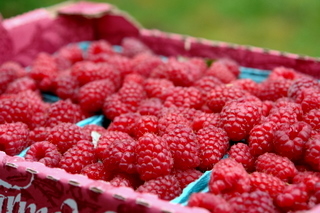 Who can resist freshly picked raspberries at the farmer’s market? I didn’t grow up eating raspberries, but I did have a few different varieties of moras or blackberries growing in the mountains near our farm, so it’s very hard for me to resist any type of good looking berry. Summer in the Seattle area (or anywhere in the PNW) means finding an amazing selection of berries of the many different farmer’s markets. It’s inevitable that we leave the market with a couple of flats of different berries, and raspberries are usually a must. 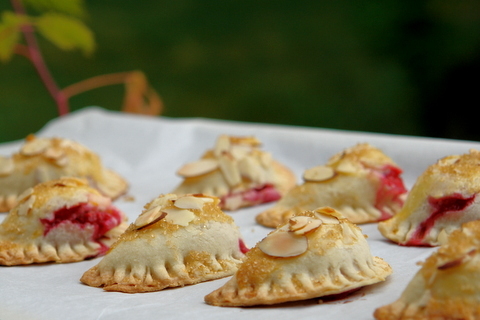 Most of time, the berries are gone before I get a chance to make anything with them, but this time I had a recipe idea in mind, so I made sure to save some for these raspberry empanadas. 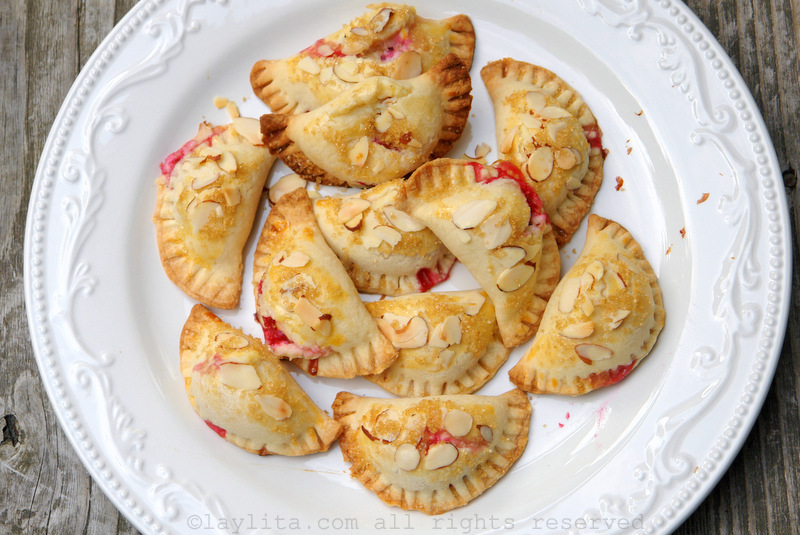 Recipe for raspberry empanadas – these delicious sweet empanadas or turnovers made with a filling of fresh raspberries, sweet citrusy goat cheese and sliced almonds. 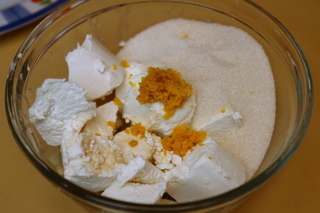 Combine the goat cheese, sugar, vanilla, orange zest in a bowl, mix well. 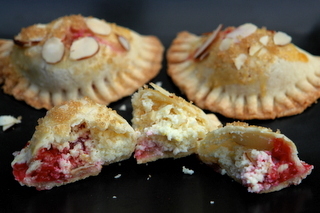 To assemble the empanadas place a spoonful of the goat cheese mixture, a couple of raspberries and a few almond slices on the center of the empanada disc. 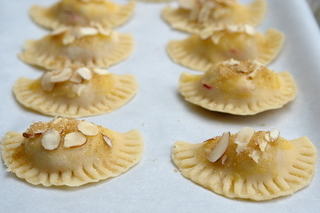 Sprinkle the almond slices on the top of the empanadas, do this immediately after you brush them with the egg yolk, it will help the almond slices stick to the empanada. Sprinkle each empanada with a little bit of the demerara sugar. Chill the empanadas for at least 30 minutes or until ready to bake, this will help them seal better. Bake the empanadas in a pre-heated oven at 375 F for 20-25 minutes or until golden. If you don't like goat cheese or don't have any available, you can replace it with cream cheese. 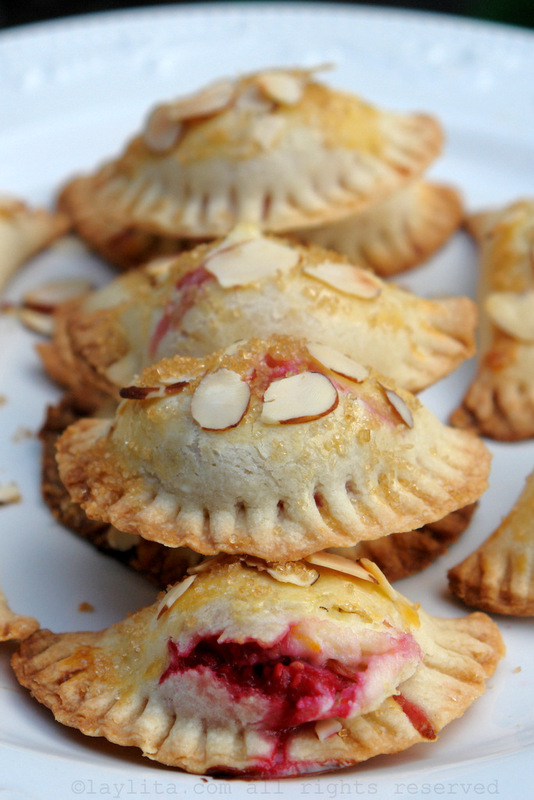 I love the combination of raspberries, goat cheese and almonds. It is a mix that works just as well in a savory combination– think of a salad with some spinach or arugula and these ingredients – or as sweet filling for baked pastries. 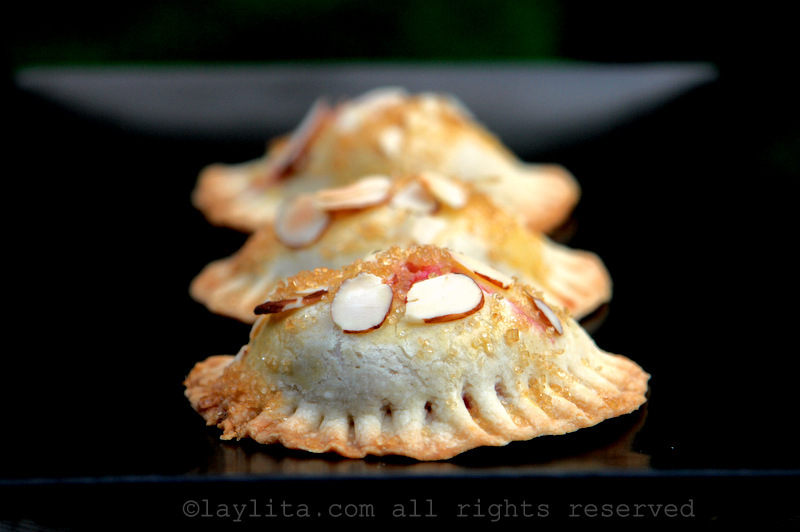 I made these for an empanada brunch – I had the classic empanadas de viento or fried empanadas stuffed with cheese, empanadas mendocinas stuffed with meat picadillo, a new experimental empanada stuffed with spicy shrimp and mango (recipe coming soon) and these sweet empanadas. I served these last and they received rave reviews. Nicolas thought these were the best ones he ever had, while another friend gave an eloquent description of how the texture was just perfect. I felt like a proud mom. 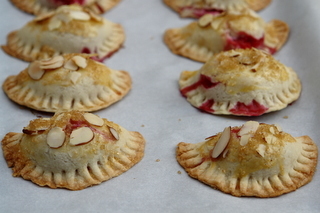 On the assembly side of these sweet empanadas, I discovered that it is a lot easier to make small empanadas. The sweet dough is a lot more fragile than the standard savory empanada dough, so making the empanada discs smaller makes them easier to assemble and the disc is less likely to crack. I’ve also noticed that with desserts- especially if like me you stuff everyone with several courses of food before you get to dessert – sometimes people like having something small, and for those who have more room for dessert, they can just eat twice as many empanadas. I’ve come to accept that sweet empanadas stuffed with any kind of fruit are likely leak a little bit and in the case of these the goat cheese and raspberries had a few almost explosion like results – basically the top part look like a small eruption took place – but it actually made them look more appealing by offering a small glimpse into what was hiding inside the empanada, and I was even asked if I made them this way on purpose. Hello, Will these be ok to prepare fully minus the almonds on top and freeze so they are ready to be baked straight from the freezer? If so, is it ok to brush egg wash on after taking it out of the freezer to bake with the almond slices??? Looking to make them for thanksgiving and take frozen to the other location to bake there. Thanks so much for the recipe… I had to substitute cream cheese for the goat cheese as I had none in my pantry but they were so delicious it couldn’t have worked out better. All of the tiny morsels were gobbled up quickly and now my nieces want them for their birthdays instead of cake! Laylita, I made these empanadas for a Southwestern-themed Christmas dinner and they were the hit of the party. I was surprised to read that we are fellow Seatteites and had to write to tell you how well my first attempt at these empanadas went. I followed your instructions exactly and mine turned out just beautiful the first time. Thanks so much for sharing. I went shopping for the ingredients, but they only had blackberries- no raspberries, and am happy to report that these work equally well! Served with some creme fraiche, they make an excellent dessert, straight from the oven. Thanks so much- delicious! 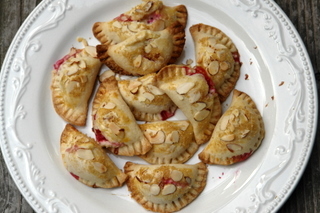 I tried these for a small dinner party I was having tonight (in part as a bon voyage party to a friend who will be spending the summer in Ecuador). I am not usually so great with pastry-type items, so I was worried . . . but they turned out GREAT! Very tasty. Thanks for sharing this recipe. They were a hit! I made these tasty little treats, for being a single guy my guest were very impressed! This was my first experience with goat cheese, ive really been missing out, cant wait to try more. thanks for the delicious recipe and the wonderful site, the pictures that go along with each step are so helpful. You know I wasn’t sure about the goat cheese and I decided to make them anyway. I LOVE them. Could I use cream cheese? If I don’t like goat cheese what other type of cheese could I use? Hi Claudia – You can try to make it with cream cheese. How come your cheese still looks fluffy? Mine keeps turning out runny after mixing everything in…I’ve made them twice now, they still taste good though. Laylita, these look amazing. 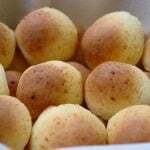 Can they be made a day in advance and refrigerated until you are ready to bake? Made these last night- they were divine. Thanks for the recipe! However, the goat cheese did explode a bit and the empanandas didnt look nearly as pretty as yours :( Next time I make these I will freeze little goat cheese balls first and add them frozen to the empanadas. (Like I do for baked or fried goat cheese) Then, I would definitely poke a few holes on top. I think that should do the trick! They are definitely worth another try! Just wanted to let you know i went ahead and tried your recipe. A word of advice, make sure and cut some slits to let air out, mine exploded :( But, my friends ate it anyway and they said the flavor was definitely there. Will try again. Thanks for the recipe! thanks for all the wonderful recipes Laylita! I’ve been searching for a capirotada recipe. My grandmother used to make hers with raisins, cheese,and cinnamon (no nuts). 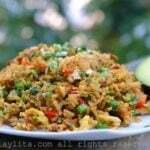 Would you be able to post a recipe for capirotada? i would appreciate it sooo much! Thank you! se ven deliciosas! gracias! ya se lo que voy a hacer para navidad. I’ve just found your blog from your guest post at Paz’ blog and now I can’t stop reading your wonderful recipes and looking at your beautiful photographs. I’m saving this one right now to make for company. Oh, wow! What special empanadas! I love the sound of the ingredients. 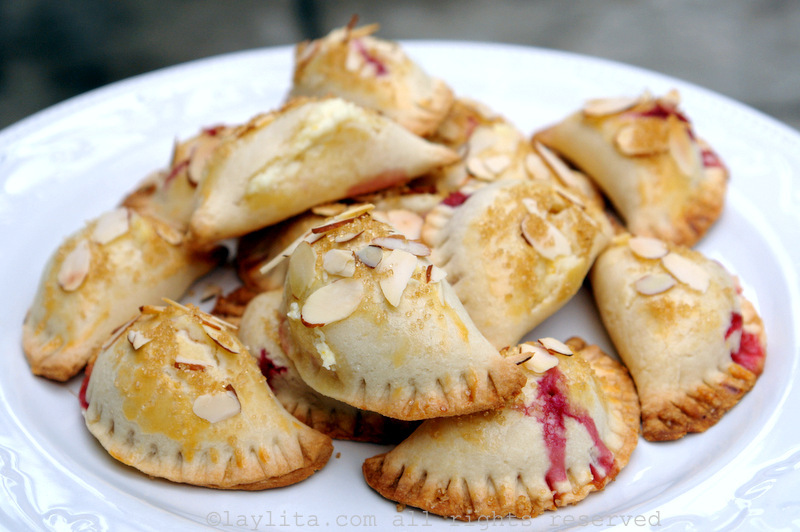 I love sweet empanadas, and this sounds like a wonderful recipe! eeee! these are so cute! 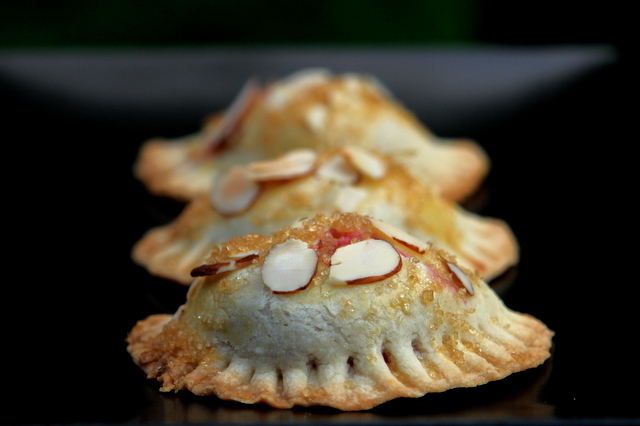 sweet empanadas are a nice twist. love the pics. These look sooooooo good. They look so cute and a great combination. Wonderful! These look delicious. I’ve never tried goats cheese, sounds like an interesting combination. They look amazing, and I love your choice of filling. Just gorgeous. Through and through. Your blog is such a feast for the senses…I can almost taste and smell your food. Thank you!!! I’m definitely going to try these next Christmas. 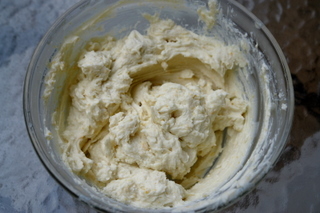 I’m kind of a newbie to this whole baking thing… plain goat cheese = chevre? Oooh they look so good. Great photo too. these sound delicious. a wonderful sweet style for the beefy, chickeny original I’m used to. Definately my next food endeavor! You make it look soo easy:) I love the fruit, goat cheese and nut combination. I made a salad the other day with hazelnuts, apple, bacon, and goat cheese! mmmm. 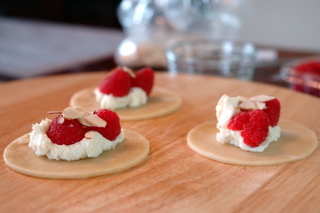 I am all about all things goat cheese – these look fantastic. WOW this is a print and a make and fast. These are so beautiful. I will give them a shot next week. I have a little social to go to and these will be perfect. thanks! I kind of like the way the slightly ruptured ones look. I think I am going to try this with dark, magenta plums. Apologies if you’ve covered this ground before in other posts, but what is your feeling on baked vs. fried empanadas?